In July 1905, sailor Joseph O’Connor traversed the Detroit docks looking for a berth. It so happened that the Great Lakes training ship Essex had some crew spaces to fill so O’Connor signed on for the trip, serving as mate under Captain F. L. Nicklett. The Essex steamed from Toledo to Detroit and back during the second weekend in July 1905, with a party of state and local officials aboard. Modest and unassuming Joseph made the acquaintance of many of the guests on board and most had no inking that he had a much more adventurous life than that of a quiet, humble sailor. Traveling far from the Great Lakes, Joseph served in the Spanish American War. He campaigned in Cuba with Company L, 32nd Michigan Volunteers, and came home with many stories of adventure to tell to his comrades on the Great Lakes. 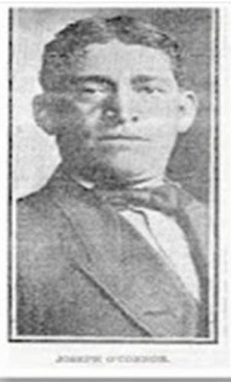 After the Spanish American War, Joseph returned to the Great Lakes and settled in Detroit where he spent six years as a marine reporter on the Detroit River reporting the vessel passages. While he worked on the river he saved 28 people from drowning. The record of his heroism is on the books at Detroit police headquarters. At one time Joseph was also a pilot on a government mail boat in the Detroit River. The little mail boats were sent out upon the river, day and night, in all kinds of weather to deliver mail to and receive government mail from passing ships. He earned the reputation of being the most daring man along the river. He had a trick of catching the great liner Northwest going under full steam that caused longshoremen and sailors of the Great Lakes to shake their heads in admiration. He showed great skill, excellent judgment, and great powers of endurance in performing his duties. Joseph faced an even greater challenge during a sailor’s leave in Chicago. On December 30, 1903, he was waiting to be shaved in the Iroquois barber shop on West Randolph Street in Chicago. Suddenly, the colored porter rushed in shouting that something was happening in the Iroquois Theatre a few blocks down the street at 24-28 West Randolph Street. The Iroquois Theater had been open only a month. Sparkling new and advertised as fireproof, it had attracted a standing room only crowd for this holiday matinee performance of the popular musical “Mr. Blue Beard, Jr.” Of the 1,900 people crowded into the Iroquois, most were women and children. By 1903, after a long history of theater fires in Europe and the United States, fire precautions were well developed and practiced by many theaters, including firemen stationed near the stage with fire extinguishers, hoses and pikes for pulling down scenery. In case of fire, an asbestos or iron curtain would drop down cutting off the audience from the stage and burning scenery. Adequate exits and trained ushers would enable patrons to safely escape a burning theater. The Iroquois Theater management did not take adequate fire prevention measures. The theater scenery consisted of many canvas backdrops painted with flammable oil paints and hung in midair close to multiple hot lights and to add to the danger they locked many of the exit doors. At 3:15 p.m. one of the hot lights in the Iroquois Theater ignited a velvet curtain and flames immediately burnt a path upward. The fireman on duty had only two tubes of a patent powder that he sprinkled on the fire with no effect at all. The theater management had not provided fire hoses, extinguishers or any other tools to fight fires above the fireman’s head. The inexperienced stage crew pulled down the asbestos fire curtain too slowly and it got stuck before it reached it’s full down position, either because of projecting lamps or cheap wooden tracks. The malfunction of the curtain left a gap that allowed flame and smoke to reach the audience. The orchestra played on as the fire spread and the lights went out. People panicked and the leading actor urged them to stay calm and remain in their seats. The people who stayed in their seats died in the smoke and flames. The Iroquois Theater managers had added iron gates over many of the exit doors. Some doors were unlocked but could only be opened by levers that most theater patrons did not know how to use. Other doors opened inwards. The theater employers did not open the doors or direct people to safe exits. Many people were trapped behind unopened doors and the time needed to open other doors added to the panic and forced people to use the main exists. Joseph gave an eyewitness account of what he saw at the Iroquois Theater.“We all hurried into the street, but there was no sign of fire anywhere, and my first imprison when I saw those frightened faces and staring eyes, was that a murder of some dreadful kind had been committed and that it was the cause of the stampede,” O’Connor said. People were not only burned, but died from being trampled to death in the stamped to escape the fire. Trampled bodies were piled ten high in the stairwell area where the exits from the balcony met the exit from the main floor. More people died when fire broke out underneath an alley fire escape. People above the fire jumped and they died as they hit the hard pavement. People jumping later landed on the bodies and lived. The same thing happened as people jumped from the balcony to the main floor of the theater. All of the deaths and injuries happened within the 15 minutes after the fire started and the Chicago Fire Department extinguished the fire within half an hour of when it started. In a little over 15 minutes, at least 603 people died at that matinee in the Iroquois Theater. Among the 500 performers and backstage personnel, the tight rope artist who was caught high above the state was the only one who died. One result of the tragedy was the adoption of new safety regulations for theaters. Among the bodies that O’Connor found and carried from the theatre was that of Mrs. O’Donnell, wife of one of the proprietors of the O’Donnell & Dorr Brewing Company. “She was in her seat, with arms outstretched having been killed instantly by the first blast of flame from the explosion on the stage,” he said. At the inquest Joseph O’Connor testified that he knew that four of the sixteen doors of the theatre were locked. The City of Chicago awarded Joseph O’Connor a gold medal for his heroic actions in the Iroquois Theater fire. Joseph went back to his home in Detroit and other maritime adventures on the Detroit River that he loved. Later while navigating his beloved Detroit River, he heard that the Iroquois Theater, the building mostly undamaged, reopened less than a year later and operated as the Colonial Theater. The Colonial Theater was torn down in 1925, Joseph O’Connor has gone to his sailor’s rest, but the Detroit River still flows agelessly through lands and lives.